When it comes to business, Customer Service is the first line of defense. Our Customer Happiness Engineers are always ready to jump in and provide assistance and since they are in a constant communication with our clients, their attitude, speed and quality of response are of utmost importance. Empathy is nourished and widely accepted, not only in our Customer Happiness team, but in our company as a whole. By putting ourselves into our clients’ shoes each time when we read a ticket or an email, we accept and understand the frustration a problem can provoke. However, there have always been and there always will be problems – that’s a fact. Everybody thinks his problem is the greatest problem one could possibly have at that moment – that’s also a fact. How can we determine the level of frustration a problem has provoked? 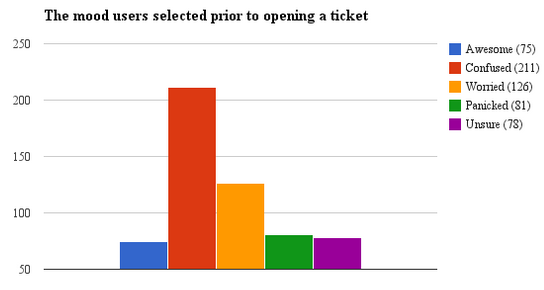 How can we know for certain that our prioritization of the tickets we receive is right? These are the questions we asked ourselves here at ManageWP and we wanted to put our assumptions to a test. We were determined to improve our Customer Service even more and we needed some baseline in order to do so. Therefore, we decided to conduct two tests. I know that when a new ticket arrived, I always wanted to know what was the real tone behind the words inside the ticket. If a client wrote “I need assistance” did that mean “I need assistance right now or I am going to blow something up” or “I am not in a hurry and if you could take a look at this, that would be awesome!”. Sometimes you can read behind the lines in a text and guess the mood of your client (and that’s a great skill!) but wouldn’t it just be a lot easier to provide them with an option to tell us how they feel? We were curious how many people will actually choose one of the given options from the drop-down list and which mood will prevail. After some time, we took a look at the statistics and out of 935 users who submitted a support ticket, 571 user chose one of the given moods. To our surprise, “confused” won decisively. The key takeaway of this test is that the majority of our clients who end up opening a ticket are simply confused which leaves a lot of space for us to improve our User Experience. Our software can be found confusing in certain situations and that is something we are going to change soon (keep an eye on ManageWP in January, we’re preparing something special!). Now, given the information we gathered, we had a baseline to conduct our second test – what does urgent mean to our clients and will they try to prioritize their problem no matter what its nature is. In our Customer Happiness team there is a golden rule which we all follow – no matter whether a client is using a free or a paid version of our software, everybody will get the best possible support we can provide. The highest priority is always a new ticket that a client opens, and afterwards the time of the last reply. By adding the Urgent button, we had to break our golden rule for the duration of the test since the tickets with the label of Urgent became of the highest priority. We wanted to be absolutely sure that we were doing the right thing with our golden rule and whether we needed to add a few modifications to the way our system works or keep things as they are. During one week, there were all kinds of urgent problems – which hosting provider we can recommend, how to edit a WordPress theme, where to connect a Dropbox account on ManageWP Dashboard etc. Don’t get me wrong, we give our best to assist our clients even when the issues are not directly related to ManageWP. The reason behind this is that we offer help when it comes to ManageWP but also WordPress/web related things and we can assist in all non-ManageWP related stuff as much as our time and resources allow us. But the whole point of the Urgent button was to prioritize tickets and I don’t think that having a dilemma in choosing a hosting provider can have a priority over a crashed eCommerce site. Of course, real urgent tickets also arrived and we took the necessary steps and provided the best possible support we could. I don’t mean to brag but our support statistics is quite awesome! In any case, we were quite surprised at the end of the test. We found that only 22% of the tickets that arrived were marked as urgent. Some of them were just an abuse of the Urgent button but the majority was indeed of highest priority. When I look back, the Urgent label helped us a lot in a few situations but it was also quite a distraction sometimes. When a ticket arrives, our Customer Happiness team members decide its priority on the spot. I trust their judgment since we’ve spent a lot of time together and a great amount of effort was invested in their training and also in building our hiring process. Is our approach wrong? Time will tell, but I have a feeling that we are walking the right path. What do you think? Head of Customer Happiness team at ManageWP, WordPress enthusiast and chess fanatic. I couldn’t agree more with your decision to drop the ‘Urgent’ button and go back to treating each case on its merits. Even though I am a more than happy user of ManageWP, if I have a problem, the problem is always urgent TO ME in MY mind, even if it isn’t really urgent in the grand scheme of things, so the urge to hit that button marked ‘Urgent’ would have always been there. Without it, I have to make a decision on the ‘Feelings’ dropdown, and that brings home to me whether the problem is REALLY urgent, or whether I am just ‘confused’ and THINK it is urgent! And that gives you and your team a better chance to sort out the issues fairly and deal with the REALLY urgent issues first, which is how I think it should be done. Incidentally, I have had to post a few support tickets, mainly due to legacy problems from my previous web hosts and website management system, and every one so far has resulted in a quick and friendly resolution, even with problems that weren’t directly related to issues within ManageWP, and so far every one has finished with a 5/5 rating, so your current system is definitely working as far as I am concerned. A Happy New Year to you and all the staff, I for one can’t wait to see what 2015 brings in ManageWP, but I know it will be awesome! Thank you for sharing your thoughts, Terry! We are always looking for the ways to improve our Customer Service and it really matters a lot when we find out that our opinions and conclusions match the ones of our clients! This is going to be an exciting and indeed awesome year, no doubt about it. Happy Holidays!